Sometimes, you want a little bit of everything. You want a little bit of class from your car but you also want something sporty… and a bit of all-wheel drive ability wouldn’t hurt in the mix. You get all this in the 2018 Audi RS 4 Avant, which is due to arrive in Australia very soon. In some ways, it’s hard to put the Audi RS 4 Avant into an exact category when it comes to the body style. It’s definitely not a teeny little hatchback and it’s probably not a sports coupé, a sedan or an SUV. It definitely isn’t a van, a people-mover, a ute or a roadster. It’s either a large five-door sports hatch or a very, very sporty station wagon. However, no matter what you call it, the 2018 Audi RS 4 Avant looks good and has the oomph and performance to live up to the looks as well. The stylists have gone for geometrics and angles rather than curves in the design to create and end result that’s got just the right blend of sleek sophistication and assertiveness. From the honeycomb grille and deep air intakes at the front, past the tidy roof-edge spoiler through to the pair of exhausts at the rear. A motif that looks a bit like the numeral 7 seems to have been used throughout the styling including in the LED headlights, the angle of the spoiler and even the styling of the 19-inch alloy wheels. All in all, it’s a very aesthetically pleasing car that seems to have been put together by an artist or a sculptor, rather like the old Audi TT from 10 years ago but with better balance. The 2018 Audi RS 4 Avant is not just a pretty face, however. This is more than just a nice-looking station wagon or five-door hatch. This is something wearing Audi’s RS label, which means that it’s going to have something rather fearsome under the bonnet. And it certainly does: a 2.9 litre V6 Biturbo engine. A shade under three litres may not sound much in comparison to, say, one of the older V8 4-L Fords, but thanks to the fine tuning and the efficiency, this medium-sized engine can put bigger units into the shade, as it’s able to pump out 331 kW of power and 600 Nm of torque – and yes, this is a petrol engine, in spite of having the torque figures we usually see with diesel engines. With that sort of twist on tap, you might guess that the 2018 Audi RS 4 Avant has a blistering 0–100 km/h time. It certainly does, pulling off the sprint in a mere 4.1 seconds. Quattro all-wheel drive with a sports differential helps to keep the handling, responsiveness and balance nice and trim. Inside the Audi RS 4 Avant, this vehicle continues to offer the best of all worlds. There’s lots of room front and back, and plenty of headspace for the front and rear passengers. In the front seats, you can find sports seats that have a massage function as well as Nappa leather upholstery – perfect for those long drives. The Audi virtual cockpit features a 12.3 inch display panel to keep you informed about what’s going on. The full details about the features and driver aids that will be available in Australian versions of the 2018 RS 4 Avant haven’t been revealed by Audi Australia at the time of writing (not even the number of gears in the tiptronic transmission system! ), so we’re going to have to wait and see. However, if the overseas models are anything to go by, we’re likely to be able to enjoy a very nice selection indeed. In the driver assistance, active safety and performance department, we’re likely to get stop/start functionality, RS sports suspension, drive mode selection, cruise control, braking assistance, electronic stability control with the works, collision pre-sensors and parking assistance (though whether this involves cameras and/or sensors or the ability to park itself remains to be seen at this date). You’re also likely to get triple-zone climate control, Bluetooth connectivity, voice control, several USB ports and a very nice Audi sound system. However, we’ll all need to be patient to find out exactly what we’re going to get! 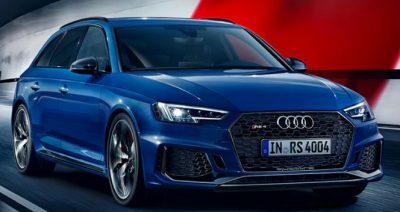 The Audi RS 4 Avant is due to hit Australian sales rooms and roads at some time after March 2018. I know that I, for one, can’t wait to see it! For any more information on the Audi RS 4 Avant, or for that matter any other new car, contact one of our friendly consultants on 1300 303 181. If you’d like some fleet discount pricing (yes even for private buyers! ), we can submit vehicle quotes requests out to our national network of Audi dealers and come back with pricing within 24 hours. Private Fleet – car buying made easy!